The plot twist…that moment in a story when an event or experience dramatically shifts the future direction of the storyline and all the characters involved. I’ve always found these moments fascinating, and so I started this series—called “The Twist”—where I meet entrepreneurs to hear their success stories and explore the plot twist that led them to start their businesses. 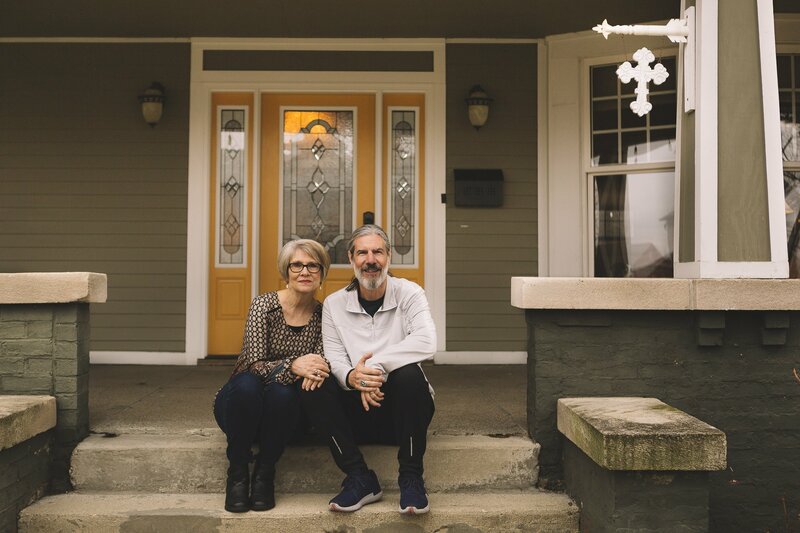 In 2012, Dave and Beth Booram decided — in the middle of a recession — to pack up their house and relocate from the relative comforts of Fishers, Indiana to a 100-year-old house near the Fall Creek Place neighborhood of Indianapolis. And today, the couple operates Fall Creek Abbey (formerly Sustainable Faith Indy) — an urban retreat center in downtown Indy. This is the story of their personal retreat from working within the confines of complex organizations and living inside the white picket fences of suburbia to working for themselves and residing in the beautiful grit found south of 38th street. And the spiritual movement within them that guided this whole journey. Joe: We always start these conversations pretty easy. Please share a little bit about your backgrounds. David: Well, we grew up on the southside of Indianapolis. We both went to Southport High School and met when we were 14. We weren’t the classic high school sweethearts, but we had our moments of coming together here and then. Went both went to IU Bloomington and had four great years down there. And then we went on staff with Campus Crusade for Christ — or called Cru now — and kind of bounced around the Midwest. We were with CRU for 17 years, and I also went to seminary up in Chicago. Then I became one of the pastors at Grace Community Church up in Carmel. We were both on staff there for about 10 years. Joe: When did you get married? Beth: It was 1979 — a year after we graduated from college. He went on staff at CRU right away, and I waited a year — once we got married. This May, we’ll celebrate our 39th anniversary! David: We have four adult kids — 28, 30, 32 and 34 — who all live in Indianapolis. So yeah, we pinch ourselves. We raised really insecure kids. Joe: Ahh, that’s the trick. David: Yes, raising secure kids is way overrated. Joe: Good to know! Talk a little about your spiritual upbringings. Beth: Neither one of us grew up in homes with any kind of faith tradition. We did not have a lot of imprint from our parents and our families of origin in terms of our own spiritual life and sensibilities. It was really in the latter part of high school and college that things began to click for each of us individually in our own desire for God and wanting to explore faith. Joe: Tell me about this Sustainable Faith movement you two are a part of. What are its roots? And how did you first get connected to it? Beth: To answer the first part of your question, I’ll start with answering the second part. As we said earlier, we went on staff at this large church in Carmel where we experienced some really formative years that began to open us up to more of a generous Christian faith and worldview. We had nine really good years, and one year that was really horrible. A lot of really painful things happened during that year. We both resigned simultaneously, because we came to a point where we could no longer stay. Our hearts were broken. Our trust was broken. And we just didn’t see any other way. We had two kids in college, a third one getting ready to go to college, and a fourth at home. So this was a pretty huge decision, because we didn’t have an exit strategy. For me, that journey was a little more of a steep decline and then probably a little more of a steep return to my own kind of orientation — where I returned at a very different spot than I had been before. David’s was a little more gradual into the deep abyss of what he was grieving and a little more of a gentle return. "During this time, I began to be won over to the way 18th century Quaker Rufus Jones would put it, 'I pinned my hopes on the quiet processes and small circles in which vital and transforming events take place.'" Beth: In my descent and return to my own faith and what I really cared about and believed in, it was very transforming. One of the things that I identified is that I expended most of my energies in really big initiatives. We’d been a part of two very large, complex organizations, a lot of our man-hours and financial resources were put into those big moments where you gather large numbers of people and hope that big things happen. I think through our downward spiral, I just began to really question how valuable that was, whether it was equitable, and something important and really quiet began to happen within me. During this time, I began to be won over to the way 18th century Quaker Rufus Jones would put it, “I pinned my hopes on the quiet processes and small circles in which vital and transforming events take place.” I began to pin my hopes on those kinds of things, and one of those things was the experience of spiritual direction. I’d been meeting with a spiritual director on and off for a number of years, but it wasn’t until this season of life that I started to think about offering spiritual direction as an expression of ministry. Someone introduced me to Sustainable Faith and to its founder, Dave Nixon. I chatted with him and learned about their program. Then, I applied and was accepted into their spiritual direction program. And as these thoughts were forming in me over the course of nine months, at some point, I finally spoke it out loud. I was finally able to identify a yearning that I had inside me to give birth to something new—to name it. I expressed to David what it was that I really wanted to do, and he was very supportive, and yet, at the time, he couldn’t imagine himself participating. He could support me, but he just didn’t see himself as a partner. That’s where the journey began. Joe: And what exactly is a spiritual director. How does it compare to a counselor, a therapist, or some of these other terms we might be more familiar with? Beth: That’s a good question. For many people, it’s not a familiar term, especially if you happen to be Protestant. Spiritual direction has been around a really long time. They can trace the beginnings of it to the third and fourth centuries, but it’s been primarily a ministry that’s been nurtured within the Roman Catholic, Anglican, Episcopal or Orthodox traditions, until maybe the last 30 or so years. Now it’s becoming much more relevant within Protestant circles. It has some similarities to pastoral counseling in that it is generally a one-on-one relationship, and it has a spiritual dimension to it. The difference is that, in spiritual direction, the director is not really telling the person you’re meeting with where you need to go spiritually. We believe that the spiritual direction is within this person, and we help them identify that direction. It’s not issue-oriented. I’m not looking for the problems or the issues you’re having. It’s looking for the action of God in your life and asking questions that enable you to notice, explore and respond to God’s initiative. Joe: And what were you both doing for income during this time? Beth: I had been on staff as an intern in pastoral ministry at a Lutheran church for a couple of years, until they found someone ordained. I also went on staff about a year and a half later at a Christian church as a spiritual formation director. I’d had a couple of gigs, but neither one of them felt like they could be long-term fits for me. David: For me, I was really done with big organizations, and I wanted to start my own business. Something that had my values and was an expression of what I believe in. And at the time, as Beth mentioned, we had two kids in college. I’d seen them go through a process of evaluating, “Who am I? How does that translate into education and good work?” And so I decided to create a career counseling business. I got some certifications and was off and running with that. Vocationally, we were searching for our groove. Beth: It took quite a while. You know, when you start something, it takes a few years for it to really start to produce income sufficient enough to keep yourself afloat. Those were some very tenuous years. David: Well, and we were not tremendously healthy, either. We were being stripped emotionally, spiritually, and relationally — in addition to trying to find or launch a new practice. It wasn’t calm waters that we were navigating internally. Joe: And so, Beth, you already shared your part of the plot twist. David, talk about what it took for you to get on the same page, if you will? David: I think the moment for us happened when Beth was invited to a writer’s retreat at a lovely rural setting in Virginia, and I tagged along — staying in the margins and doing some painting. Retreating. But along the way I must have just been absorbing the experience. I don’t know if it was fully conscious, but something just subtly started to change in me. In a compressed period of time, a melting or dissolving took place. Beth: It was a circuitous path for sure. We left the retreat and went on vacation. There, we just started engaging in these lengthy conversations and dreaming together. But there was this caveat. I’d always imagined this retreat center in an urban setting. I was increasingly drawn to a little more of a gritty environment. We lived in the suburbs, and they felt way too perfect and uniform to match the experience of my own life. I think my internal geography was being drawn to an external geography that felt more like a match. Joe: You hadn’t always felt out of place in the suburbs. But as your journey had evolved, you seemed a bit like a stranger in a strange land. Would that be fair to say? Beth: That’s a beautiful way to put it. In truth, as I look back, there were ways I always felt like a stranger. But I don’t think I could have identified it at the time, because life looked good and felt good on the surface. We had a lovely home. We had really sweet neighbors, a great neighborhood, good schools, all of that. But I did feel lonely, because we both had become very different from those we lived around. David: As we’ve named it in retrospect, I think it was like a low-level boredom that had set in that we weren’t even aware of. Beth: And so I had always envisioned it being in the city, but David could only see himself being part of this dream if it was in a rural setting. We both have a real love for nature. We just love to be out in nature. Love to hike. I think I began to shift with his desires and think, “Well, if he’s willing to come along, then maybe we just need to reconsider the location.” So we did. Then we start looking and actually found this charming log home that had the potential to be transitioned to a small retreat center. We thought, “This is it!” We scurried to get our house on the market. But it was during the recession, and we lived in a community where there were a gazillion homes exactly like ours. We waited eight months, and we showed our house 72 times. It was just, again, an agonizing process of trying to move toward this dream, but having this huge roadblock. Along the way, I kept looking at urban properties with my dear friend who was our realtor. I think I saw a house or two that came on the market, and I said, “Could we just go in here?” David came along and at one house in particular he’s like, “Maybe I would like the city. Actually, I could imagine it.” It was a really cool old home. It had tons of problems and would have taken a lot of money to renovate — but it had great potential. And i it was through this process that we began to discover the way forward. Joe: And fast forwarding a little bit, what was it about this house that stood out to you? Beth: We were open to a pretty mixed area where we would be in a place where there would be restored homes and homes that were in disrepair. We were okay with that. We were looking at major fixer-uppers and had a limited budget, but we had a fair amount of equity, so we knew we should be able to find something that would work. I remember, when we found this house, we were concerned it would not have sufficient space. But we walked up the steps and walked into this home. And I just remember my immediate reaction was, “Oh.” It had this x-factor. This feeling of sacred space, of peace — shalom. There was a solidness to it — an openness about it — and yet it had all the features of a 100-year-old home with high ceilings and beautiful woodwork. Joe: Sometimes, when you hear someone from suburbia is moving into the city you wonder — or maybe it’s just me — that they’re doing it to bring change to the neighborhood. To spruce it up. Did you have any such motives? David: Early on, I identified that we need to be here for our own formation. It’s less about that we have something that we’re bringing, but there’s something about our own ongoing conversion and formation. Living here has changed our sensibilities. We go up to Carmel now, and I start quivering a little bit. David: I would have never thought that would happen. But now, I get south of 38th Street, and I like the dirt, the mess, the grit. I like what I’m seeing. I feel at home. Joe: Thanks for sharing that journey. Let’s shift the conversation to more about this space that you offer. You hear the name Sustainable Faith House, and it can indicate to somebody that a faith tradition is required to be welcome here. Is this space open to all? If someone just wants to find a quiet spot, is this a good space for them? "I call it a container. We've prepared the container. And whatever it needs to be for a person, let it be." David: Yes and no. I think pretty early on we recognized that our energy — our time — really defines our capacity in this space. And when you start to talk about capacity, it really presses up against, “what’s the core of what we’re about here?” It’s not that we’re exclusive, but we are trying to protect the core of our capacity. And I would say the core of our purpose is to provide space for groups and teams that are doing good work. We have those who come here in the non-profit sector, faith-based non-profit sector, and churches. I’m sure we’ve had individuals here. It’s more about people in a faith crisis — kind of like that deconstruction phase that Beth and I were talking about — that maybe they need some companionship or a place that’s safe for them to really go to the depths of, “I don’t know what I believe about God, the Bible, church, leadership.” I think it’s more creating a safe place for them. David: I call it a container. We’ve prepared the container. And whatever it needs to be for a person, let it be. Joe: Over the past year, I’ve been more aware of the power of quality food. Not just the types of food I’m consuming for nourishment, the energy I give my body to survive the day, but also the process of consuming — chewing slowly, breathing in the aromas, exploring the tastes. And how the food came to my table, thinking about the hands that grew it and prepared it. How food can both fill us up and heal our bodies. I’ve been more aware of God in the food perhaps. Joe: How much do you focus on, maybe what I’m describing as, a balance of body, mind, and soul. David: We definitely think sleep and rest is part of the body piece — really encouraging people to rest and sleep without guilt. Beth: Caring for the body, is a part of how we understand living sustainable lives of faith. It is sustaining our physical bodies and cherishing them. "When we don't reflect on our life, we don't maybe take inventory of what's going on within us and all around us that we often can just live life half-asleep." David: The focus of spiritual direction, too, is not some abstract, “What do you believe spiritually?” It’s that you encounter God at the intersection of your real ordinary life. You’re an embodied person. It’s not that God’s out there. It’s that where I go, this is where I encounter God. And so there’s a lot of conversation, often, about your wellbeing as a whole person. It’s really helping people pay attention to their whole experience as an embodied person. Joe: Just a couple more questions. I love the phrase you used on your website: “deliberate thoughtfulness.” I was curious what that phrase means to you. What should somebody be striving to attain with deliberate thoughtfulness? Beth: I think it’s Socrates who said, “the unexamined life is not worth living.” When we don’t reflect on our life, we don’t maybe take inventory of what’s going on within us and all around us that we often can just live life half-asleep. Contemplation, or I should say a contemplative living, is a life that involves regular times of silence and solitude where you can sit quietly in the presence of God. This is how I explain it: sit quietly in the presence of God and allow yourself, in prayer, to really take stock of your life and how it is with your own soul. I think we are trying to encourage, nurture, and foster that kind of contemplation so that action can, in the words of a writer that I appreciate, “flow out of a rich inner life of prayer and discernment so what I’m doing is well-purposed.” It’s aligned with who I am, who I believe God to be, and what I believe God is inviting me to participate with God in the world. That requires the ebbing, slowing, becoming still, quieting oneself. I think it’s impossible to live fruitful, active lives without the counter-movement. I have another author I appreciate, Martin Laird, who says, “We have tended to say the opposite of contemplation is action, but really, in truth, it’s reaction.” We live reactive lives if we don’t take that time to still ourselves, and become quiet, and listen, and be. When we make that habit a rhythm of life, then we can begin to live much more purposefully, and fruitfully, and out of our authentic self. Joe: How does one take the silence they receive in this place back home with them? Where they don’t see this space as a false reality, but a true experience that they can take and make into their everyday reality? Beth: This silence is always available to us. I really believe that at the center of our being — the core of ourself — we can find a deep and profound silence where our true self lives in union with Christ. That silence is with us at all times and available to us, but we find it difficult to find our way there. I’ll say that one of the practices that we talk about most with people who come here is what we call “slow mornings.” We do go to bed pretty early, around 9:30 p.m. or so, and we get up around 6:00 or 6:30 a.m. We don’t schedule appointments typically before 9:30 a.m., and so in that time typically we allow ourselves a couple hours to sit, think, pray, read, reflect, and journal. Sometimes we’ll exercise, and then we get ready for our day and have breakfast. I think that entering the day slowly and contemplatively has become very grounding and would be probably one of the most critical practices that we think will help people. Not everybody can organize their life like that, but there probably is something that you can do to establish a daily rhythm of slowing. David: Yes, helping a person discover what are some rhythms that they can create. The Christian life in many ways is just a movement of returning again and again and again. We do have to attend to things. We’ve got limited mental, emotional, and physical energy. We have to be engaged with things, and then we get to return. We have a need for a return. And these are the places that we can return — be held, reattune, recalibrate — and then we can get some movement in and out. I think we live in a culture that values speed and efficiency. I think doing things slowly can be a spiritual practice. And so, as you are doing life, just doing them at a more moderate pace can open you up to pay attention to the present moment, the person you’re talking to, and all kinds of things. Joe: That’s so great. How has running this place — offering this space the past five years — impacted your own spirits? David: I think that we’ve found a form that fits us. And within that, there has been an increased freedom to get to know our true selves, and then to honor and live out our true selves — not try to be someone else’s true self who’s doing other really cool, neat things. There’s contentment in knowing who I am. This form fits who I am. I think there’s been an experience of increased freedom because of that. Beth: I think we feel more rooted and grounded in our place in life right now than ever before. Maybe that’s some of the fruit of being at this stage of life — in our early 60s — and focusing on the things that we really want to be focused on and having the freedom to do that now. In some ways, it’s really rooted in being content with where you are. I think that being here and feeling very content with what we have the opportunity to do and kind of staying put has been very grounding, anchoring. That’s been transforming. WHICH ENTREPRENEUR SHOULD I TALK TO NEXT?